Christians often keep their church and working lives in separate compartments. They may want and even try to live for Christ in the office, factory or school, but somehow what they learn on a Sunday seems not to bear on what they are doing on Monday. Is being a Christian at work any more than not swearing or stealing paper clips? John D. Beckett thinks so, and his book is a bold call to transform the workplace into a place where the kingdom of God is experienced. He recounts some of the struggles he has encountered during his long career in business and management, and how they have enhanced his understanding of his faith and work. He introduces several biblical characters as role models for living out faith in the workplace, and focuses on five themes where biblical truths and business realities intersect. The author weaves three principles into his workplace agenda: a warm personal relationship with the Lord, a closer alignment of faith and work, and the multi-faceted expression of God's kingdom. Throughout this challenging book, he grounds these ideas in Scripture and applies them in practical ways to the working lives of his readers. "Modelling values-driven leadership in a Christian business, John Beckett's story goes beyond personal transformation to show how God can transform an entire workplace through his people." John D. Beckett is chairman of R. W. Beckett Corporation (Elyria, Ohio), which, with its new affiliates is one of the world's leading manufacturers of residential and commercial heating systems. He is board chairman of Intercessors for America, a founding board member of The King's College in New York City and a director of Graphic Packaging Corporation. In 1999, the Christian Broadcasting Network named him "Christian Businessman of the Year." He received an honorary doctor of laws degree from Spring Arbor University in 2002, and was named manufacturing "Entrepreneur of the Year" by Ernst and Young in 2003. His first book, Loving Monday: Succeeding in Business Without Selling Your Soul, is currently available in over twelve languages. 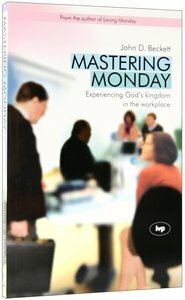 He has also written Mastering Monday: A Guide to Integrating Work and Faith.